Acting Assistant Chief Fire Officer Greg O’Dwyer talks to Adam Hyland about preparation for snow, ice and other weather extremes. In Ireland, we are fortunate that we don’t face the type of extreme freezing temperatures common in other countries in winter. However, we are not completely immune to dangerous adverse weather conditions, and in the winter months ice, snow, and flooding can make the job of the DFB even harder. It is important, therefore, for the DFB to have not just the right equipment, but the right preparation, in place, in order to be able to respond to emergency calls, no matter what challenges the weather brings. That preparation, as Acting Assistant Chief Fire Officer Greg O’Dwyer tells me, is vital. 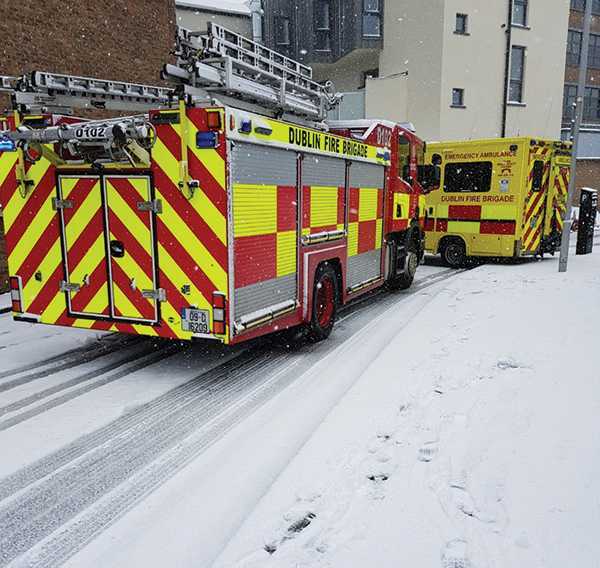 “One of the challenges we have with adverse weather such as snow, ice or flooding, is not the hazardous road conditions, but actually getting the personnel into their stations so that we can operate as normal. Once in the station, crews also need to adhere to the preparedness plan in order to ensure that each unit and vehicle is capable of safely reaching a call out. Snow and ice make the job of the DFB even harder. To prepare properly, each appliance’s heating system and valves should be checked and tested to ensure they will function properly in winter, and further checks should be done regularly to ensure extreme cold has not adversely affected them. The vehicles themselves see adaptations that make it easier to manage adverse weather. In order to handle snow and ice, for example, the right weather tyres are put on vehicles, snow chains go on to appliances, ambulances are fitted with snow socks, and snow shoes go out to all stations. “Our engines are heavy enough to get a good grip,” Greg tells me, “but we also have 4-wheel drive where possible, plus we have snow chains, so we have good traction. As a result, it is rare for an engine to get stuck. There can be a few instances where the ambulances, despite the snow socks, can get stuck, but not that often.” Ambulance personnel will be given extra overgarments during adverse weather, as well as extra grips or cleats to go over their shoes. Though the DFB vehicles are well prepared, as Greg says, the introduction of additional 4×4 transport that came on board in September will no doubt prove invaluable, should we see severe, snow or flooding. “The new 4×4 vehicles are stationed at Tara Street, the OBI and the workshop on Stanley Street, and will be ready to be called into operation as required,” Greg says. “If we do have an adverse weather forecast this winter, we can prepare by getting those vehicles and any extra equipment needed in and centrally locate it before sending it out to areas where it is needed most. The new DFB 4X4 vehicles. “Those new 4x4s will of course not only be useful in snow and ice, but in flooding, because they can get through deeper water, as they are fitted with snorkels,” Greg adds. Having the right equipment, preparation and support vehicles in place is essential as adverse weather arrives, because inevitably there will be an increase in calls, due not only to collisions on the roads, but because the DFB become the only point of contact in an emergency situation. 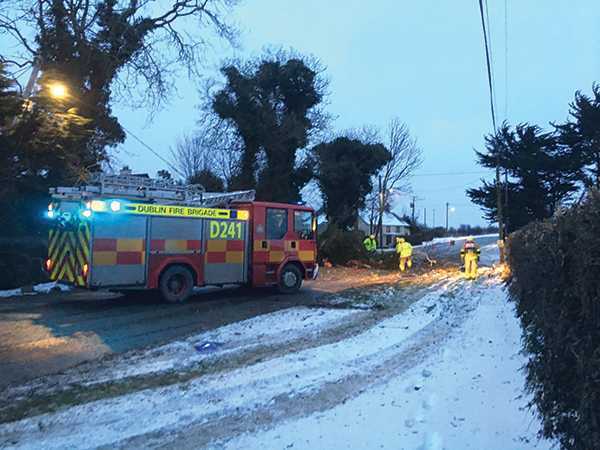 Of course, in extreme snow and ice it can be more difficult to get to a call out, but because it is so important that the DFB does get there, it is simply necessary to exercise extra caution to arrive on the scene safely. If you don’t arrive, you can’t help anybody. That caution – slowing down, anticipating increased stopping distances and unexpected actions by other road users – is something all DFB crews can ensure, but there are other factors that can’t be helped. One such factor is other road users who may not have the necessary equipment to deal with hazardous conditions. “The problem is that while your vehicle may be able to progress, those around you can’t, so you can get stuck behind a long line of traffic,” Greg tells me. “With heavy ice, you often see vehicles on slipways on dual carriageways that have come off the road or jack-knife, and these can cause big tailbacks that block the entire way through, so it can be difficult to progress. Cold weather can definitely take a toll on firefighters and equipment, but with proper preparation, maintenance and awareness, the job of the DFB crews can be made a lot less difficult. Firefighter and Dublin Ladies GAA star Lyndsey Davey talks about teamwork on and off the pitch. It’s never easy to find a good work/life balance, but when you do, things can turn out pretty sweet. 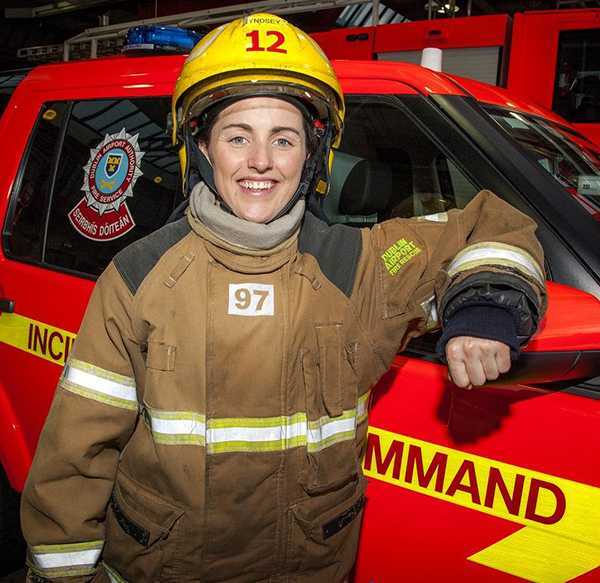 That’s certainly the case with Dublin Ladies Footballer Lyndsey Davey, who has managed to combine her role as a firefighter in the Airport Fire Service with her hugely successful career as a triple-All-Ireland-winning GAA star. 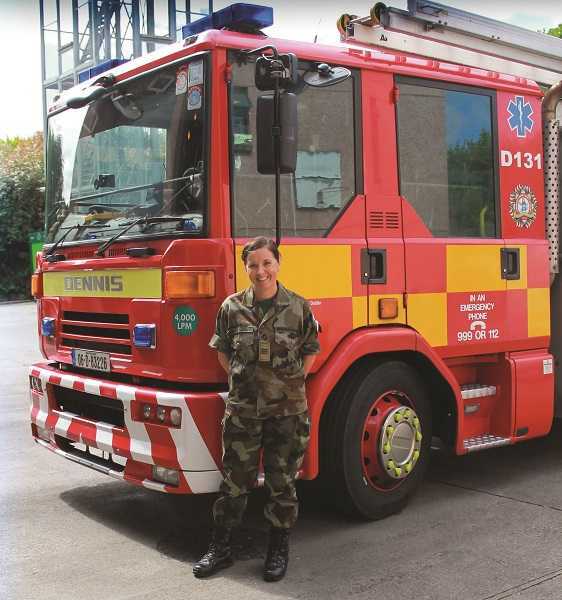 Having previously worked in finance at Croke Park after completing a business degree at DCU, Lyndsey jumped at the chance to join the fire service at the airport three years ago. Success on and off the pitch is all about teamwork for Lyndsey, and she finds many similarities between the two. 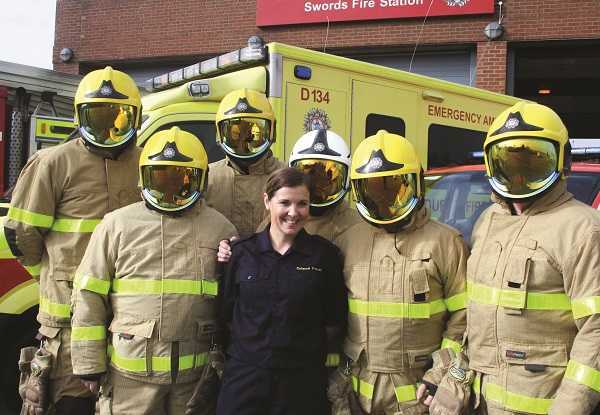 “I actually think that one of the key aspects that helped me get the job in the fire service in the first place was that I was heavily involved in the Dublin team,” she says. “I definitely think the fact that I was able to give examples of when I showed strong teamwork abilities was one of the reasons I got the job. 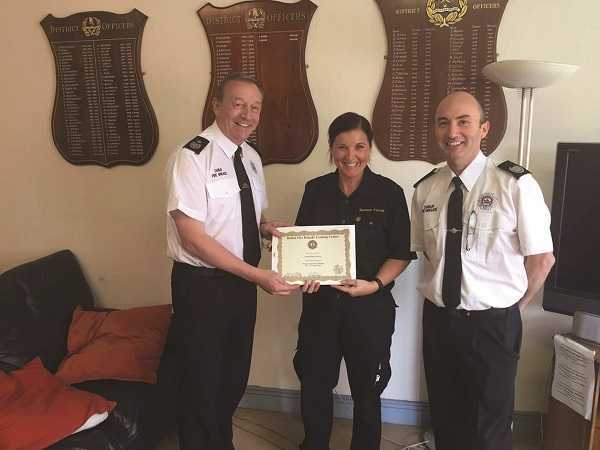 The similarities, however, are much more evident, Lyndsey says, and if anything, her job with the fire service has actually helped Lyndsey to thrive on the Gaelic pitch. Not only does her varied role – aviation and terminal emergencies, airfield safety, wildlife management, attending vehicle accidents and running inspections – keep her active every day, but the support of her colleagues and flexibility of her shift work mean she can usually find the time for training and matches whenever she needs to. “I’m very lucky to work with such a great bunch of lads and ladies,” Lyndsey says. “If it wasn’t for the crew, I wouldn’t be able to play football, because I can get shift cover from any of them and pay them back by covering their shift another time. If it wasn’t for them, I’d be lost. I’m also lucky in that I can sometimes work a shift in lieu and then have the time off to train or play a match, and there is such a supportive working environment full of camaraderie that enables me to do what I do, so I am very lucky where I am. 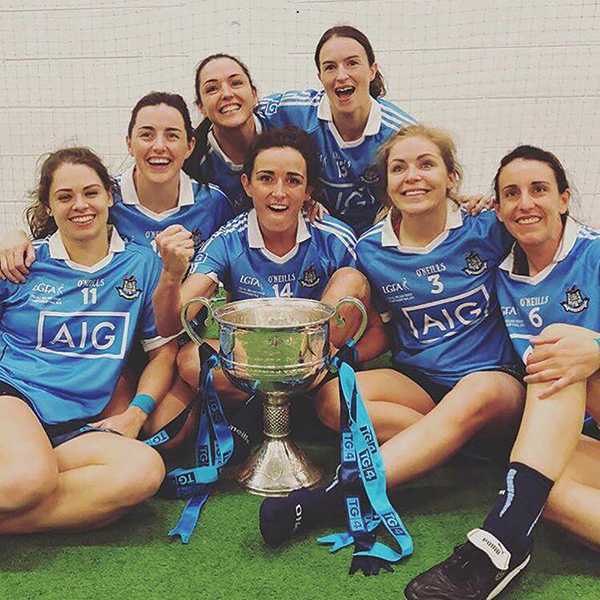 That strength and fitness, not to mention an enormous amount of skill and dedication, has seen the Dublin Ladies team and Lyndsey enjoy a lengthy run of success. 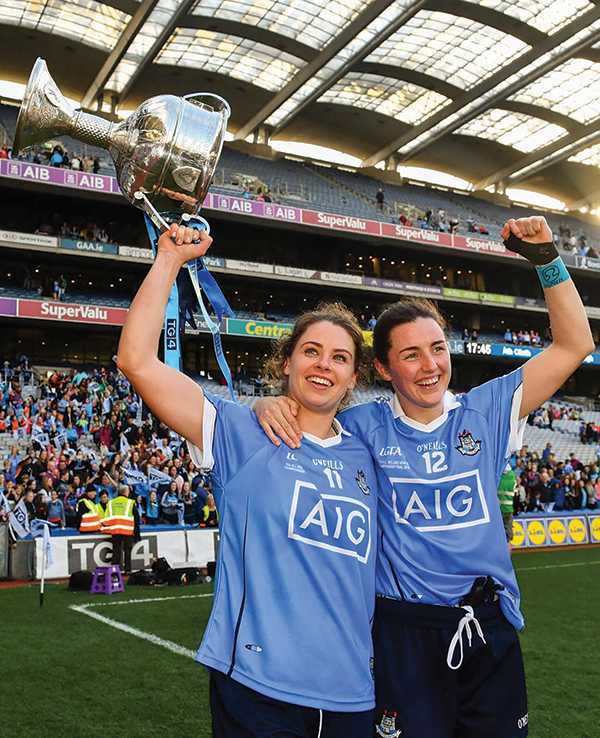 This year’s All-Ireland final victory over Cork was their second in a row, and while Carla Rowe, the daughter of a DFB member scored two goals, it was half-forward Lyndsey who gave a Player of the Match performance. Lyndsey Davey with teammate Siobhan McGrath. 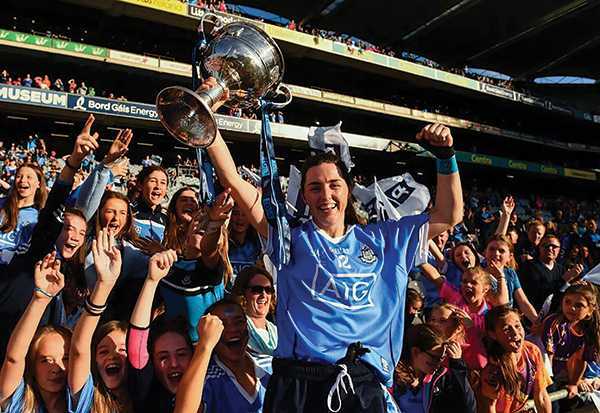 Lyndsey Davey with members of the winning Dublin team. At work with the Airport Fire Station. Lyndsey Davey with Noelle Healy. On a personal level, Lyndsey has now won her fourth All-Star nomination and this year was shortlisted for the Player’s Player of the Year Award, but like a true team player, she hoped her team-mate and captain Sinead Aherne would win out (which she did). 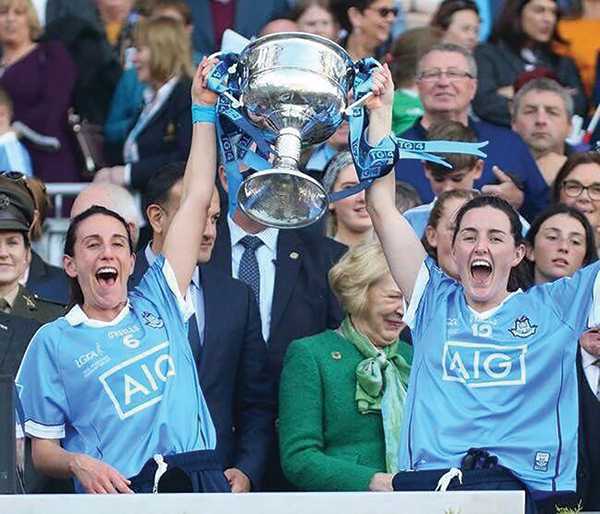 “It’s a really special nomination to get, because it is voted on by the players you have been playing against all season, and I think it’s great for Dublin as well that there are two of us up for the award – to have two of us nominated is really special,” says Lyndsey. Recent rumours have suggested that 28-year-old Lyndsey is thinking of retiring from the Dublin panel she has been a part of for half her life, but she tells me she is still “in two minds about it”. Whatever Lyndsey decides to do, she will be busy in the future. She will continue to play with her club side Skerries Harps, and one day would like to take part in a triathlon, though with a more relaxed approach than she is used to. Before that, though, there will be some more hard work. Given her career to date, it’s safe to say Lyndsey will only continue to become an even more valuable member of her team. Dublin Fire Brigade Pipe Band Major Mark Toner reviews the band’s recent activities. You won’t be surprised to hear that your band has been extremely busy since the previous issue of Firecall, sliding into the year’s end and a well-deserved Christmas break after an extremely busy 2018. The band finished off the summer months with a number of high profile engagements. A place at the final of the Fleadh Cheoil na hÉireann in Drogheda saw the band once again in the competition circle, taking a solid second place against a small number of similarly graded bands from County Down. 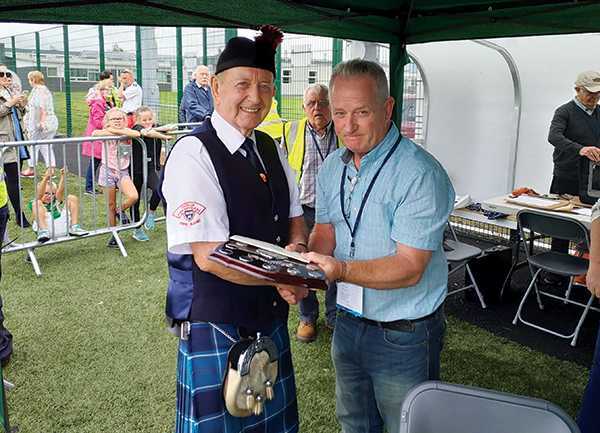 Retired member Paul Shannon, one of the band’s earliest members and tenor drummers, accepted the prize on behalf of the band. A good base to draw on and continue to improve, and the experience only adds to future performances. 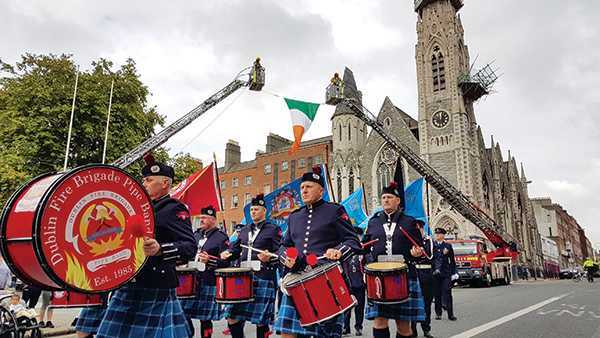 Immediately after this the band were thrown head first into preparations for the now annual FESSEF celebrations, and once again led the DFB contingent in the march from Parnell Square to Dublin Castle. Our involvement in FESSEF didn’t end there, as we were centre stage in the National Concert Hall for the Emergency Services concert, along with our colleagues from the Irish Prison Service and the National Ambulance Service pipe bands, for what was a magnificent concert. As you know, the band is made up of volunteer members, however, this did not detract from the monumental amount of effort and practice required from the playing members, and of course support from our families and friends, in preparation for these high-profile events. The long hours of preparation during the summer months for these events continued to pay dividends as once again the band were well received on the evening of DCC’s Culture Night in City Hall, where we played to large gathering of locals and tourists alike. Tenor drummer Paul Shannon accepts the 2nd place prize at the Fleadh. This was followed by a number of charity events the band were happy to be a part of. Elements from the band were also part of recent DFB sporting occasions when a piper and drummer led our GAA team onto the pitch in Croke Park in a friendly game against our NIFRS colleagues, and again when our rugby team recently played the Dáil Seanad team in Donnybrook stadium. Proud to help represent DFB on both occasions. Requests we try extremely hard to honour are those from our own members and representative organisations. None more so than the biennial DFB Sports and Social club retirees function, this year held in the Castleknock Hotel and Country Club. The band were proud to perform for DFB’s recently retired members at the reception on the evening, many of whom have been loyal supporters of the band over the years. Our own piping stalwart, Paul Byrne, was one of the recipients, and still managed to strike up a few tunes on the evening. Well done Paul, and we wish you a long and happy retirement from all in the band! We finished off the year with the bands’ AGM, whereupon the current executive of Chairman Paul Keyes, Secretary John McNally and Treasurer Stephen Pender were voted back into place, and a new appointment of Alan Corcoran to leading drummer was made. So if you think you have what it takes to become a band member, why not come along to the OBI any Monday night from 1930hrs onwards and earn the right to wear the band’s crest on your shoulder! Beginners are very welcome – and don’t worry, musical ability is not necessary, you’ll be thought and provided with eveything you need! Our door is never closed, so if you are a previous member and find yourself with a little more time than before, we’ll be glad to have you back. The band can be reached at any time through any band member or by email at [email protected] or via any of our social media pages. It’s your band! The DFB Rugby Team met an Oireachtas XV in a fundraising game for Suicide Or Survive. The DFB Rugby Team played out a close-fought match against an Oireachtas XV on 24 November, and though they couldn’t come away with a victory, the real winner was the Suicide Or Survive charity, with much-needed funds raised for them on the day. 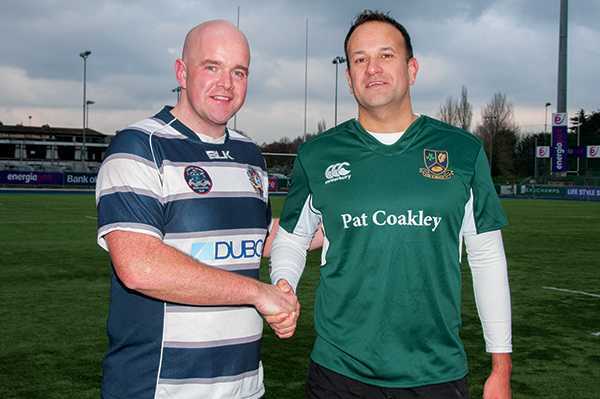 Having beaten the Defence Forces and our friends in the Northern Ireland Fire and Rescue Service this year, it was time for the newly-reformed DFB Rugby Team to take on the Government itself at Donnybrook Stadium. Suicide Or Survive focuses on breaking down the stigma surrounding mental health issues, and ensuring those affected have access to quality recovery services. As Firefighters and Paramedics, we are often the first help to arrive after a person has, has attempted to, or is thinking about taking their own life. We see first-hand the devastation that suicide or mental health issues unleash on a family. We, too, recognise that under our uniform we are people, and are also as vulnerable as the next person, so this match was an important event. Before a ball was kicked, bucket collections took place in St Stephen’s Green Shopping Centre on 27 October, and in the city centre in November, and this was added to by the donations made at the match. Unfortunately, on a cold and dull November day, the combined Dáil and Seanad XV came out on top in a closely fought 7-0 win, with a youngster called Leo Varadkar playing alongside TDs, senators and government officials. Former Leinster and Ireland prop Mike Ross also togged out and played a section of the match for each team, while DFB Tallaght’s Sara Phelan, club captain with Clondalkin, and the Oireachtas team’s Mairead Carty, club captain with Navan, were also notably getting stuck into their male counterparts. The DFB and Oireachtas XV teams. The game, which was free to attend, kicked off at 11.30am, and was ably overseen by referee Su Carty, the former player, coach and now IRFU representative to the World Rugby Council. Played over four quarters, there were a few other rule variations that allowed for team switches and for veterans to tog out and be a part of what was a day of fun and fundraising. The only scores of the closely contested game came when the Oireachtas XV managed to notch up a converted try by captain Senator Neale Richmond before the close of the first half, with the DFB team coming close to parity a few times but unable to break through themselves. After the game, a reception lunch took place in Old Wesley Clubhouse, with politicians, senior DFB officers and family members all coming together to raise awareness for mental health wellbeing and suicide prevention. DFB Rugby Team Chairman Keith Mason said: “It was a really enjoyable day. In the end, the score didn’t matter. What was important was to keep the charity in mind, raise money, and have some fun. The DFB Rugby Team would like to thank all who took part in this important fundraiser, including the Dáil and Seanad team, our own players, ref Su Carty, the fans, the DFB Sports and Social Club, sponsors on the day Sky Ireland, the High School Rathgar for supplying us with new Gilbert balls, Ken O’Dwyer of Flashpoint Medical Systems for supplying water bottles and cones, the fundraisers and volunteers from Suicide Or Survive. On a cold December day, C Watch in Phibsboro show Adam Hyland around. The day was dull when I went to visit Phibsboro Fire Station recently, but the same could not be said of life for the crew of C Watch here. As part of Charlie District, Phibsboro station is tasked with handling calls from the north inner city to north west Dublin, providing support for both the Blanchardstown and Finglas stations, so they can expect to be faced with a range of incidents and challenges. 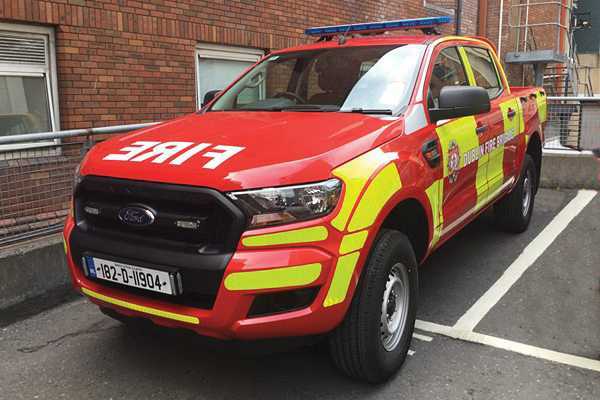 Because of its location, Phibsboro Station can also respond to river rescue call outs as part of a normal Pre-Determined Attendance from HQ, but the number of specialists in C Watch also means they are in high demand for other incidents. 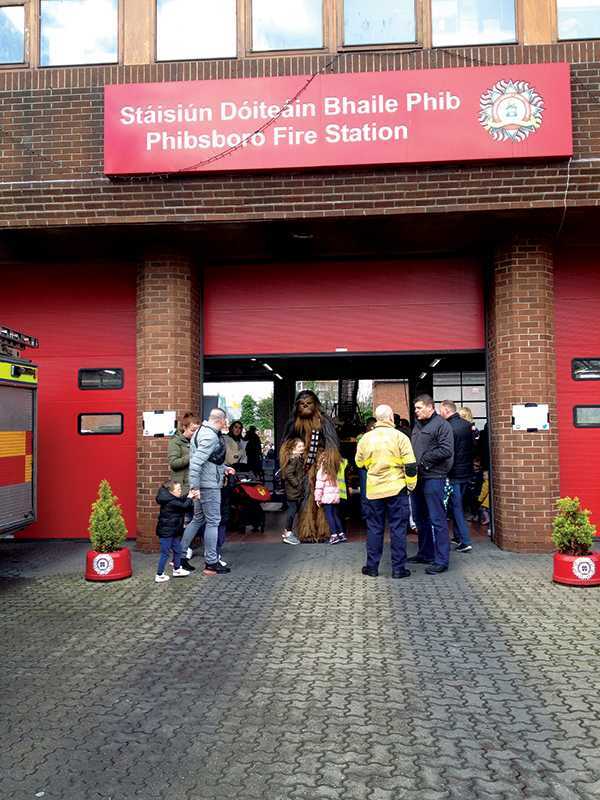 They can’t promise Chewbacca will be there, but C Watch always welcome visitors. The Garden of Reflection at Phibsboro Station. Mark Keogh grins and bears it. Jonathan Forbes demonstrates the danger of chip pan fires at the Open Day in November. Ger Corcoran checks the HIAB crane. Kevin, who moved to the Phibsboro Station from the OBI in September, and Johnny Eastwood, are both advanced paramedics, and this results in the crews being called out frequently to serious incidents. 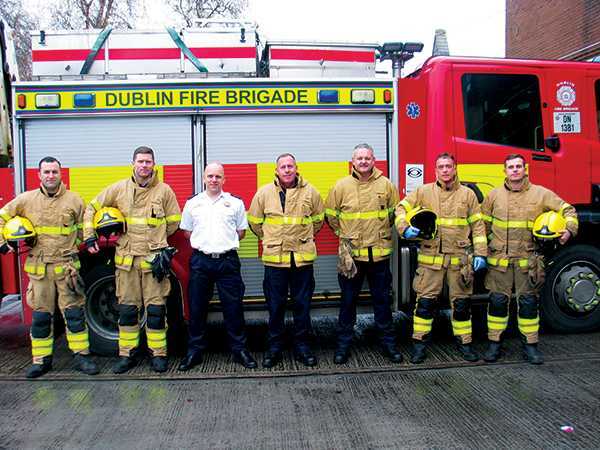 The Phibsboro crew also includes the DFB’s high line rescue specialists, which again means C Watch are in high demand. “The rescue truck has all of the high line gear for rescues from height – cranes, towers, etc – but we have the only lads here who are trained in this,” Kevin tells me. Although the station has been around for a long time and hasn’t seen much in the way of renovation (apart from new gates), it serves the crew well, with the large yard perfect for drills, and the rec room and mess are both cosy and relaxing places for C Watch to unwind. A walk through shows that when able, the crew are relaxed, happy to talk and joke. 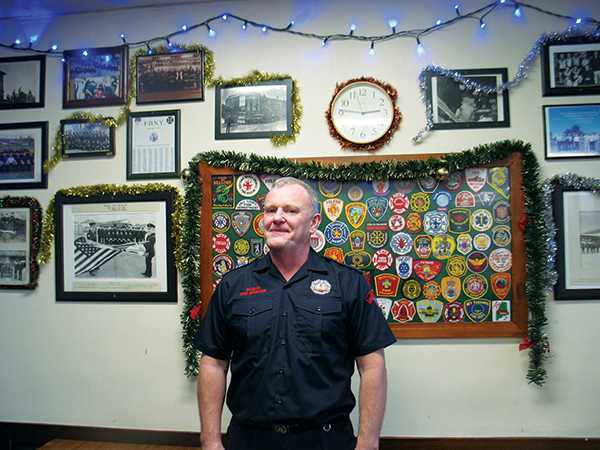 A welcoming and laughing Mark Keogh takes a moment away from making a cup of tea to pose beside the many badges from other fire departments on display, then the newly-erected Christmas tree. There is rarely much peace and quiet though, as Kevin tells me. “Your day is normally set out for you, punctuated by call outs. Mornings see daily checks on equipment that can go on until 11am, then you have duties throughout the day. The afternoons are usually spent doing exercises or drills, or familiarisation, because there are so many new builds going up. For instance, the student accommodation in Phibsboro, and then Grangegorman is huge as well. Just getting familiar with that, even just driving around to learn the layout and access to hydrants.” This rising population in this area also adds to the workload for C Watch. “The high density of the area increases risk factor – Grangegorman has 6,000 people there now, for example – so you have the added risk of high-occupancy apartments. You have to be very careful when you go into those places,” Kevin says. Despite being so busy, all of the crew seem in good spirits and enjoy a lot of banter that shows how well they obviously get on. That becomes immediately evident when members of the crew return from a call out to find me taking pictures of Kevin, James Courage and Ger Corcoran as they check equipment, and are only too happy to get in on the act and joke about the worthiness of each other. 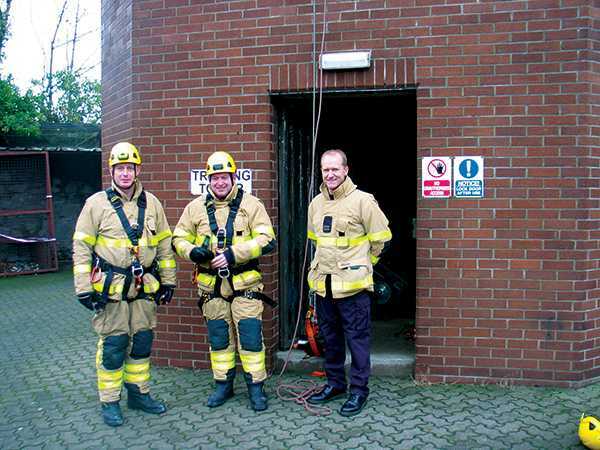 High line operators Alan Brady, Keith Wilson and Dermot O’Reilly are also keen to provide some pictures, and go back up the training tower to, literally, show me the ropes, while Richie O’Sullivan is “busy hiding” from the camera. On any given day, there are usually 13 crew members, as well as the DO and Kevin, and they range in age and years of service. “Paddy Dunne is here a long time,” Kevin tells me, “and he is due to retire in March 2019. We also have to give a hat tip to Gerry Sweeney, who is unfortunately out sick for a long time. He is sorely missed in the station because he really is the life and soul of it. He’s a great guy. He is due to retire soon too. Mark Keogh is probably in 25 years now, so he has given great service too. “Then we go all the way down to lads who are only here a couple of years. We have two young lads in their 20s – James Courage and Daniel Simpson – both good guys. Even though they are no longer recruits, we still call them that, and will keep doing that until someone newer arrives.” Despite their varied experience, C Watch get on very well with each other, and work together exceptionally well too, as Kevin tells me. “The camaraderie here is fantastic, and the entire crew are genuinely great. Nothing is ever a problem to them. The Open Day we ran in November, for example, was done just among the on-duty staff at the station, and they were all happy to do it. Anything you ask to be done gets done without any issue. The Open Day Kevin mentions was organised to raise money for the Movember charity campaign for men’s health, and C Watch in Phibsboro is very much the HQ of the Frontline Mo Bros, the group set up and captained by firefighter Jonathan Forbes to help raise funds and awareness for male cancer and mental health issues. “Johnny does get help from a few regulars, but he almost single-handedly set that up and runs the show, and he does an amazing job of it,” Kevin tells me. Many of the C Watch crew were sporting impressive moustaches on the day, grown out over the course of the month of November, and to see them freshly shaved required a second look to recognise some faces I had previously met. Hundreds of people showed up for the Open Day, and for C Watch, being part of the community is very important. “The door here is always open and visitors are always welcome,” Kevin says. 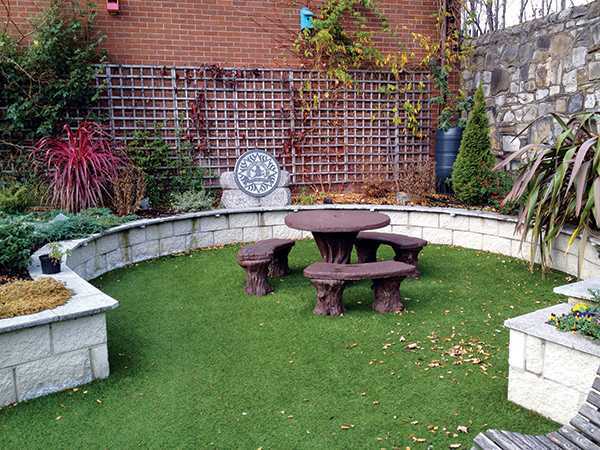 “Obviously it depends on our schedule, but if someone passes by with their child and they want to have a look, if they want a picture taken or anything, we would never turn them away.” I’m delighted to say that spirit included my visit, so thanks to all at C Watch Phibsboro for showing me around. The DFB took part in a major simulated terror attack and mass casualty training exercise at DCU on November 16. 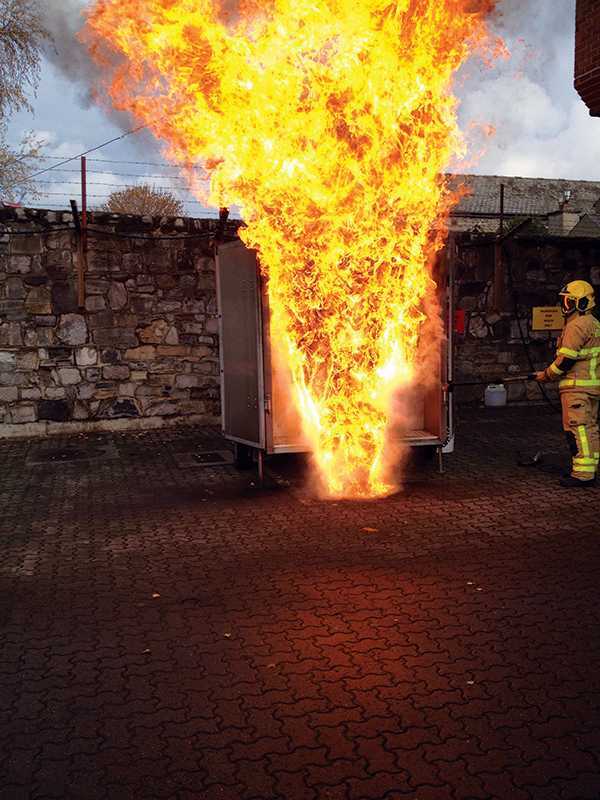 The inter-agency training exercise, Operation Barracuda, was led by An Garda Siochána and involved specialist response units, the Defence Forces, the National Ambulance Service, as well as recruits from the Dublin Fire Brigade. It was designed to test the capabilities of first responders in the event of a mass casualty incident or terror attack, with the focus on saving saveable lives. The assailants and victims were played by 50 recruits from the Garda college at Templemore. 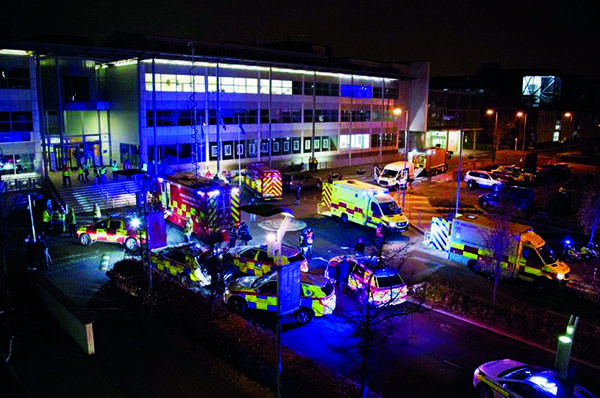 In the real-time tiered response, the simulated operation began when the Garda control centre received a 999 call at 7pm reporting a road traffic collision at DCU campus. Local Garda units responded first, and quickly determined that mass casualties were involved. Crews were mobilised from the OBI to attend, but within minutes it was elevated to a major emergency when a number of “assailants” primed their car with explosives before getting out and stabbing and shooting people on the campus. A second call for ERCC Communications and Mass Casualty Units was then made. As gunfire erupted, the DFB and NAS crews were tasked with the rapid extrication of further casualties, and to take cover in safe areas. Blanchardstown Station Officer Mark Fay is also a recruit course trainer at the OBI. He was Initial Incident Commander at Operation Barracuda, tasked with the role of liaising with the other agencies and coordinating the emergency response from the DFB. For him, the way the operation played out was realistic, and a useful training exercise for the DFB recruits. “When we arrived, we were told that there were still active shooters in the area, so we were prevented from going further into the campus by the Armed Response Unit and Garda officers, which is realistically what would happen. For us it’s about working in a safe area. We wouldn’t be sending a crew into an area that wasn’t cleared. The recruits were given no advance warning of what they could expect from the exercise, but Mark was happy with how they handled it. “They did very well,” he said. “It was a bit daunting for some of them because it was the first time they had to work with another agency, but they triaged every casualty. As the exercise continued, one of the assailants was shot dead before the two remaining terrorists retreated into a building and shot more casualties, taking a number of hostages. The Garda Armed Support Unit moved in, while a joint DFB/NAS team of paramedics established a Casualty Triage and Clearing Station in an adjacent building, where they could remove and treat casualties it was possible to save. 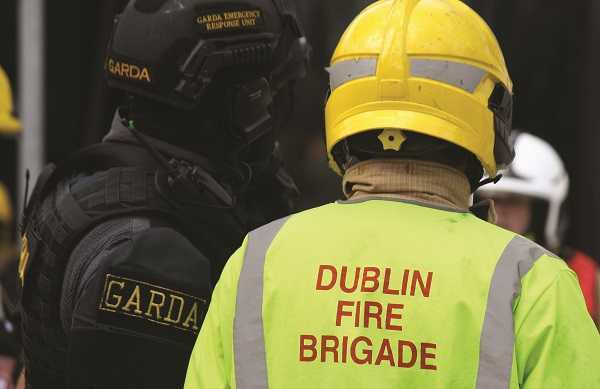 As fire erupted in the main building, armed gardaí stormed the area, shot the assailants and retrieved the hostages, before DFB firefighters were allowed to enter to extinguish the fire and remove casualties to paramedics. As members of the Defence Forces Explosives Ordnance Disposal unit dealt with the booby-trapped car, DFB and NAS paramedics continued to triage, load and transport the “wounded” to hospital, and after an hour, the exercise was wound down. Although performed in real time, each agency had prepared for the training exercise individually, starting with desktop scenarios and building gradually to the operation itself. Greg O’Dwyer, Senior Fire and Emergency Management Officer, was involved with the operation from the start and acted as the DFB’s lead in its planning and preparation. 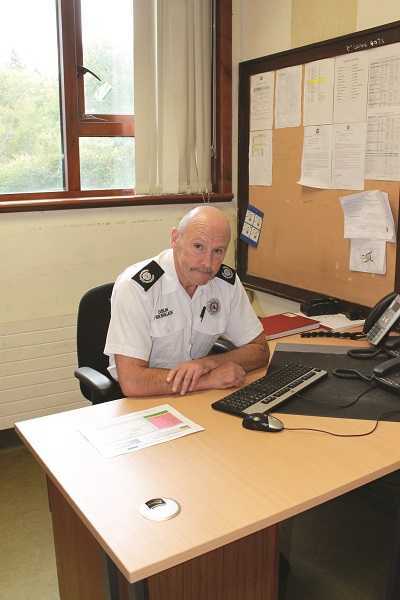 On the night itself, he and the Chief Fire Officer Dennis Keeley acted as narrators for VIPs and media present to witness the events unfold via security cameras and the various comms, and he was keen to see how inter-agency cooperation would work. the scene, is also shared to all responding agencies. Greg also thought the exercise went very well.“The real takeaway for the DFB was how well we worked together with the HSE’s National Ambulance Service. Obviously, we needed a lot of coordination and on the ground organisation between the two agencies,” he said. 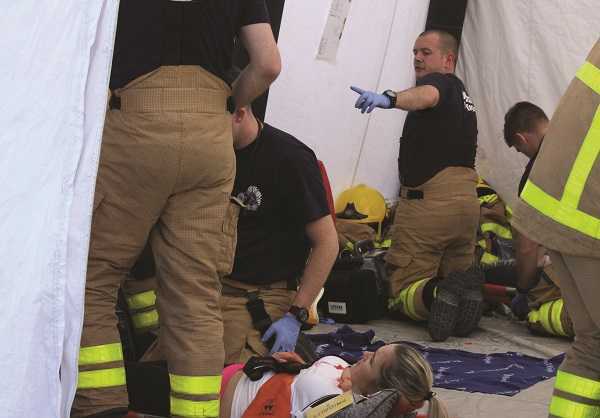 “In a mass casualty incident, your training is important, but so too is coordination in trying to get through all the casualties, and bring them to safe locations for treatment. If such an incident was to happen today, after that exercise I would be very confident we would work very well to get the best possible outcome. Above: DFB’s management team with the certificate. Third Officer John Guilfoyle outlines the process by which Dublin Fire Brigade was granted certification to OHSAS 18001:2007 by NSAI. 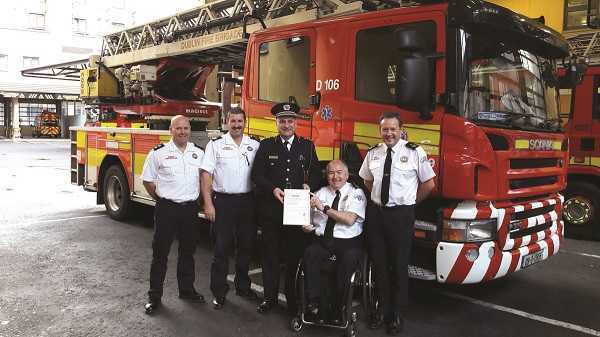 Dublin Fire Brigade had reason to celebrate last year when the service was awarded OHSAS 18001 certification by the National Standards Authority of Ireland (NSAI). Recognised worldwide as the highest international standard for Occupational Health and Safety Management Systems (SMS), OHSAS 18001 provides a framework to identify, control and decrease the risks associated with emergency service activities. ACFO Terry Kearney, with responsibility for Health and Safety, outlined the process involved in achieving accreditation. “The OHSAS 18001 accreditation followed a rigorous external audit of DFB’s policies and practices by the NSAI. The process included detailed interviews, samples of operations, and workplace activities inspections in all sections of DFB,” he explained. The establishment of the full-time Health and Safety Unit was a key element in the organisation successfully implementing the OHSAS 18001 Safety Management System. 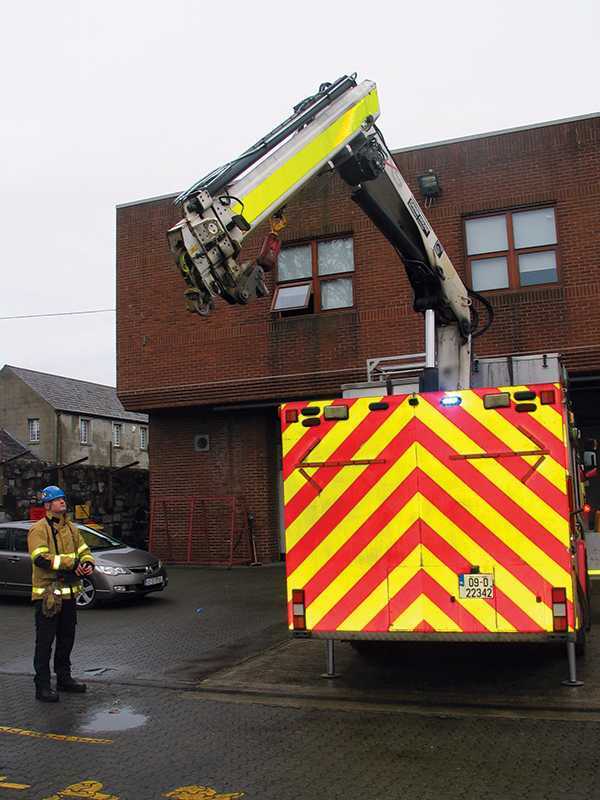 The Health and Safety Unit based in DFB HQ facilitated the audit process across the service. The establishment of the full-time Health and Safety Unit was a key element in the organisation successfully implementing the OHSAS 18001 Safety Management System. The Health and Safety Unit is managed by Third Officer John Guilfoyle and has three full-time staff: District Officer Thomas Keane, Station Officer Mark Hogan, and Station Officer Chris Tallon. The role of the Health and Safety Unit is to advise the CFO and DFB on occupational health and safety. Its function is to support the introduction and management of DFB’s safety management system. The legislative requirements with which DFB must comply are set out in the Safety, Health and Welfare at Work Act 2005 supported by the General Application (Regulations) 2007. DFB chose OHSAS 18001:2007 as the most appropriate framework to manage safety, health and welfare within the organisation; using OHSAS 18001 also aligned DFB with the safety management recommendations from the Local Government Management Agency (LGMA). DFB achieved accreditation because of the hard work, support and commitment of its entire staff who assisted with the numerous internal and external safety management system audits during the accreditation process. DFB also received invaluable support, assistance and guidance from DCC’s Corporate Health and Safety Office. By achieving accreditation to OHSAS 18001, DFB now has the framework of an internationally recognised safety management system to maintain and further develop a safer, healthier environment for its staff.